Personalized mirrors not only identify your company and create long-term brand recognition, they're a compact item your customers and clients hold onto and pull out whenever needed. Our printed promotional diva compact mirror, magnifying mirror, makeup bag with mirror and more are great items to give away at industry trade shows and to pass out at job fairs to keep your brand in the forefront of potential employees' minds. Our dual magnification folding mirror is compact enough to keep in a purse or handbag, but offers strong magnification. 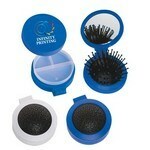 The 3-In-1 Hair Brush Kit combines together a hair brush, a pill case, and a mirror. Conveniently carry the basics in your bag or briefcase. The 5-In-1 Lint Brush is a useful kit that can help you maintain an immaculate look under challenging circumstances. The product features a lint brush, shoe horn, mirror, comb, and a sewing kit in a compact case that can be easily carried in your pocket or purse. Keep all the personal care items you need in one place with the elegant and luxurious Deluxe His & Hers Personal Care Kit. It contains a hair brush, a mirror, a sisal, a massager, a nail/toe brush with pumice stone, and bath slippers. 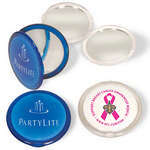 Our personalized diva compact features a durable design with space for a single logo imprint. Available with two magnifications, the Dual Magnification Folding Mirror can help you to look your best under all circumstances. Imprint your company’s logo and tagline on the casing to skyrocket your brand’s image. 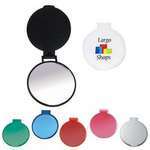 Take care of your looks anywhere with this Pocket Dual Vanity Mirror and never be worried. It has a regular and a magnifying mirror. 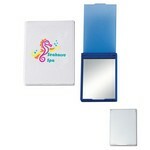 The Rectangular Mirror is a simple, yet useful giveaway at mass marketing campaigns. 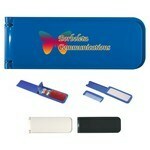 Imprint your company’s logo and tagline on the casing to skyrocket your brand’s image. The Round Mirror is a handy and compact mirror that allows you to take a quick look at yourself before attending that important meeting or to keep you looking your best throughout the day. 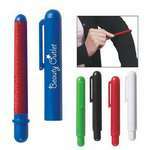 Imprint your company’s logo and tagline on the casing, to skyrocket your brand’s image. Keep small essentials and belongings safe in the Vanity Bag with Mirror and use the mirror to maintain your appearance. 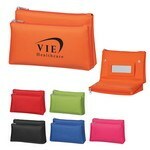 The bag has two large zippered compartments to store your money and other belongings.